Ever step on the scales and feel totally shocked that you gained weight? You honestly thought you were watching what you ate, you are consciously parking further away from the mall door, picking up your pace as you went for walks after dinner and still, there it is on the scales looking up at you. 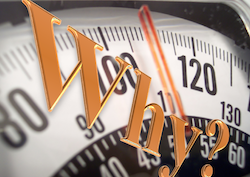 How you could possibly be gaining weight or at best not losing when you are trying so hard? You follow the weight loss directions from your favorite magazines. You are so careful and rarely eat dessert, diligently purchasing foods with labels that declare they are low fat. You almost never eat between meals but you are still gaining weight. Why am I Gaining Weight for no Reason? *** You have just settled into your work day and already there are> 100 extra calories! It is so easy to overlook how small things can add up. Calories 675 for the day: if you did this every day you could gain over a pound a week!!! Try and move your body every day. This will keep your beautiful body burning the fuel you are putting in to it. Maybe try to walk to work or stop at the gym on the way home from work. Try just 20 min and see how you feel. At work grab a clipboard and head for the stairs like you have something important to do. Go up and down the flight a few times. Grab every opportunity you have. Take the stairs instead of the electric pedway. Challenge yourself and your friends to come up with new active ideas. Eat more and don’t go hungry. Losing weight should come as a result of a healthy meal plan and not highly restricted calories. Take the time to educate yourself on great energizing foods and eat frequently. You can get full and satisfied and do not have to consume a lot of calories. So if you find yourself asking the question “Why am I gaining weight?” – one simple thing you can do right away is grab a notebook and a pen and write down everything you do eat, read all about it in How To Lose Weight Today. You’ll be amazed – and have a good place to start.